When back in May of this year, U.S.-based global integrator FedEx Corp was named among the most reputable companies in the world by the New York and Copenhagen-based Reputation Institute, a female Dutch art painter was not overly impressed. Why not is told here. FedEx used the occasion to issue a press release in which it boasted about "the culture and business success of FedEx", "the dedication of team members" and, of course the delivery of "an outstanding FedEx experience on a daily basis". All the painter remembered was the agony she had gone through a few months earlier by using the "outstanding" FedEx experience. An exclusive interview with CargoForwarder Global shows that the Memphis-based express operator, through its offices in the Netherlands and the U.S., managed to mishandle her shipment of paintings from her studio in The Hague to Chicago and ultimately Michigan, from beginning to end and in the process supplied incomplete and misleading information to the customer. 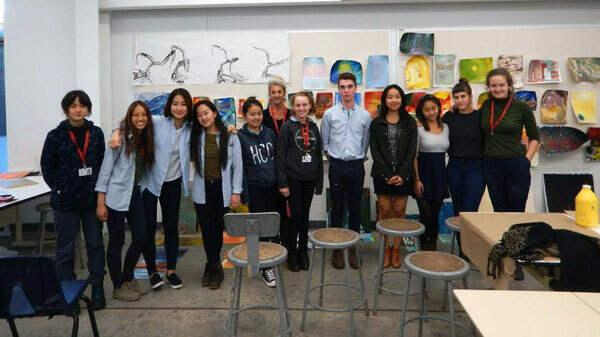 Last year, Theodora Plas (57), an accomplished abstract painter, as well as maker of screen printings, illustrations and monumental projects in glass, who has had numerous successful exhibitions of her work in various cities in Europe, Middle East, U.S. and Asia, was invited by the internationally renowned Interlochen Center for the Arts in Interlochen, Michigan, to participate in two workshops and a sample exhibition of her work. The Center wanted some 25 paintings for the exhibition, so Ms Plas initially contacted a few freight forwarders in Holland, who all claimed that they could handle the shipment by air, but ultimately declined to guarantee customs clearing and final delivery in the U.S. Besides, the quoted rates for the shipment were way over Ms Plas' budget. After her disappointing experience with the forwarders, Ms Plas in early October contacted the Dutch office of FedEx with a request for a quotation for a door-to-door delivery of her paintings in a specially designed and manufactured wooden crate, which she previously had used for other exhibitions, both in Holland and abroad. Before submitting a verbal quotation, a FedEx agent told Ms Plas the shipment would be charged by weight and not by the dimensions of the crate and, more importantly, the company wouldn't be able to handle the wooden crate because of "strict fumigation regulations" in the U.S.
Ms Plas therefore decided to order a brand new aluminum crate, which was not only smaller, but also lighter than the wooden one. By the time the aluminum crate was almost finished, Ms Plas contacted FedEx again and received a verbal quotation over the phone. "They never sent me any email or letter with quotations," she recalls, "and if I had any questions, for instance about papers for customs clearing in the U.S., or the pro-forma invoice for the shipment, they would refer me to their web site." Wanting to avoid any confusion, delays or extra costs and making sure the crate arrived in Michigan in time for the exhibition, Ms Plas regularly contact the FedEx office, only to find that every time she called, she would be connected with a different customer agent. "It was very frustrating, because it was impossible to deal with just one person, who was familiar with my shipment, so every time I called I first had to explain what it was all about before I could ask any specific questions," she says. Contact problems with FedEx aside, Ms Plas and the Interlochen Center for the Arts, at one stage both received quotations from FedEx for the same shipment. Strangely, the quotation for Interlochen - which has a corporate account with FedEx - was almost US$1,000 more than the one Ms Plas received from FedEx in Holland. Unable, or unwilling, to explain the price difference, FedEx staff in Holland told Ms Plas that she could receive a discount on the shipment if she opened an account with the company. Which she did, or at least, tried. Because even after submitting all requested details on-line, Ms Plas claims she never received any confirmation from FedEx that her application had been received or processed, or that the promised discount had been applied. Even worse, when FedEx finally picked up the specially-made aluminum crate with the 25 paintings neatly packed inside and Ms Plas presented her credit card for payment to the FedEx driver, she found that the air waybill showed that Interlochen, which had received the higher quotation for the shipment, would be charged for the shipment, and not as agreed, Ms Plas. When confronted with this move by phone, a FedEx employee apologised to Ms Plas and promised to check why different quotations for the same shipment had been presented. "Right in the middle of this very unpleasant telephone conversation, she asked me if I liked chocolate," Ms Plas remembers. "When I asked her why, she said she would send me a box of chocolates as compensation for all the trouble. I was perplexed." Not satisfied with the explanation about the price difference, Ms Plas shortly afterwards received a call from another FedEx employee who claimed that they had only traced three recorded telephone calls with her about the issue and none had contained any quotation for the shipment. Ms Plas countered that her telephone bill showed there had been at least 15 calls with FedEx and she had never received a written quotation from FedEx, only verbal ones by phone. Later the employee admitted that phone calls with customers were only randomly recorded, so she could have missed a few. "But I still lacked a serious response to my question why the account of Interlochen had been charged for the higher quotation," a by that time exasperated Ms Plas noted. Documents show that on October 13, 2014, a few days after the telephone conversation with FedEx, Ms Plas was informed by Interlochen that the crate had arrived safely and the contents had been customs cleared. However, her ordeal with FedEx was far from over. Three days later, on October 16, 2014, and to her utter amazement and frustration, Ms Plas received a message from FedEx Netherlands that the crate had not been cleared by U.S. Customs and that FedEx in the U.S. could not arrange for a temporary clearance. 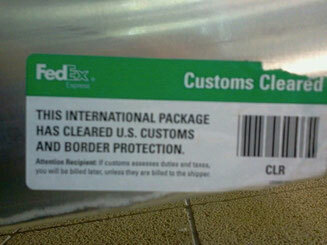 While she was looking at the picture of the crate - that Interlochen had sent her - showing a label that said: "This international package has cleared U.S. Customs and Border Protection," the FedEx message continued with the advice that she, or a representative, would have to deal with U.S. Customs directly to organise clearance of the crate. Amazingly, the FedEx message also mentioned the fact that the crate had been unpacked and the paintings were already on display. "Our apologies for the inconvenience" the message concluded, and if Ms Plas had any further questions she could call a toll-free number in the Netherlands, or chat via www.fedex.com/nl. Actually, after her return in the Netherlands Ms Plas filed several complaints on-line with FedEx, neither of them have ever been acknowledged or actioned on, nor did she receive any financial compensation for the major hassle created by the integrator. And, by the way, Ms Plas is still waiting for that box of chocolates.